Chris Eubank Snr claims his son will achieve more in the ring than he ever did, and rejected claims that his own reputation has provided a step ladder for Chris Jnr’s success. The 27-year-old is preparing to take a big step in his career on Saturday night when he faces the Australian IBO super-middleweight champion Renold Quinlan. While the IBO belt is not considered a major world title in itself, a win against Quinlan will set him up for much bigger fights in the future. 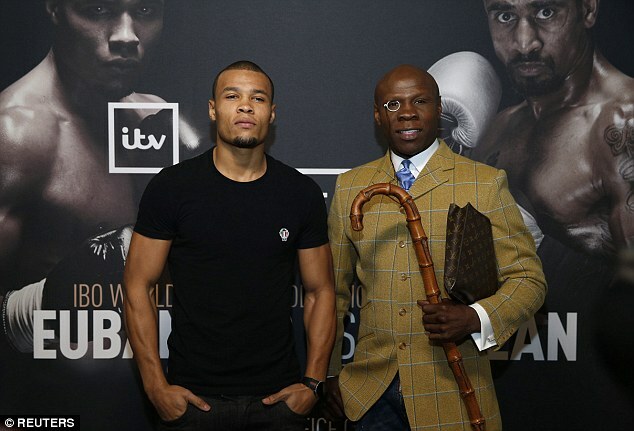 And Eubank Snr, himself a former WBO middleweight and super-middleweight champion, says he is now ready to accept that the student will become the master and overtake him as the best boxer in the family. ‘A man should always want his son to be better than him, but I am coming to close to actually realising this and I have an ego,’ he told The Times. ‘Junior has the magic. You have got people who think he has got where he has because of me. I have never taken a punch for him, I have never run once for him. The father can’t do it; he had to do it himself. 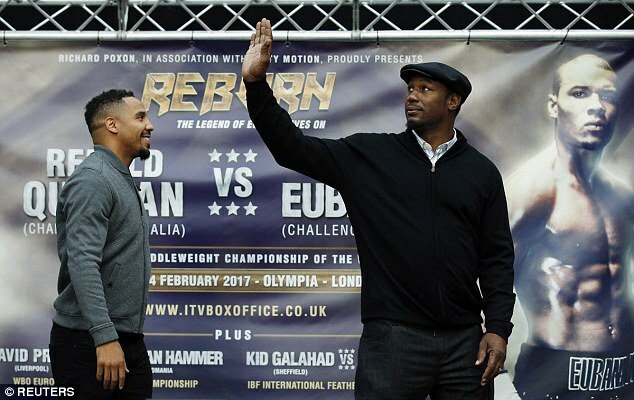 Eubank Jnr has already used this fight, which he is heavy favourite to win, to outline his ambitious career plans, including fights against James DeGale and George Groves before moving to light-heavyweight. Andre Ward, who will front the analysis for ITV’s coverage, has been warned by the father-and-son combo that they could soon takeover his division, but the 32 year old has laughed off those suggestions. Speaking to Sportsmail, Ward said: ‘Chris and his father are saying he would wreck me if we fought. That doesn’t make me angry. It makes me smile. ‘They are getting ahead of themselves. Young Chris is still a novice. You have to crawl before you can walk and then you have to walk before you can run. He’s still at the crawling stage.